The Momentum Elite is the top-performer of the Momentum series of printers. The Momentum Elite boasts the highest throughput and shortest cycle times across the entire Momentum line. The Momentum Elite is configured with a highly-efficient triple track rail system that allows staging boards for processing. Automatic Pin Placement is a patented MPM tooling solution that uses the vision gantry to precisely place and remove pins. The MPM EnclosedFlow print head delivers uniform aperture filling ans superb printing performance, especially for fine pitch devices. The result is substantial savings on solder paste over squeegee blade printing - in excess of 50% over blades for dramatically fast ROI. The MPM patented Vision and Inspection system is a cost-effective, printer-based method to verify print and paste deposit results. The system is flexible enough to handle the complete range of today's most challenging components. The Paste Height Monitor is designed to prevent defects caused by inadequate valumes of paste on the stencil. The Paste Height Monitor combines advanced software and sensor technology to accurately monitor the paste bead for volume consistency. The MPM EdgeLoc board snugging system securely holds the board during printing using a side snugging technique. This technique delivers the best print quality and is the most adaptable system for the widest range of applications. The MPM® Momentum® Elite is the top-performer of the Momentum series, with the highest throughput and shortest cycle times. THe Momentum Elite vision system is fast because it is driven by servo motors. The Elite is configured with a highly-efficient triple track rail system featuring an input buffer, a central processing section, and an output buffer that allows staging boards for processing. The Momentum Elite is intended for high-volume applications. The Momentum Elite, with its triple track conveyor rails and servo drive motors, provides the greatest throughput capability of the Momentum series, making it the ideal printer for high volume, high mix assembly lines. Wet Print accuracy of 20µm@6σ, Cpk ≥ 2, with 6σ capability designed in and independently verified. The MPM Momentum series printers are fast, precise, and highly reliable, with performance unmatched by any other printer in their class. Most printers use a single rail. This single rail requires incoming boards to wait outside the machine for the previous boards to be processed and indexed before entering to be printed. The Momentum Elite is configured with a high-efficient triple track rail system featuring an input buffer, a central processing section, and an output buffer. With triple track processing, cycle time is shortened because boards need not move single-file through the printer. A new board can be indexed into the machine and positioned next to the center nest, readying to print, while the two others are being loaded and offloaded. The ITW EAE's Benchmark software is powerful and intuitive: easy for the average operator to learn and to use. Benchmark software facilitates rapid set up, assists with operational tasks, and makes changeover quick and easy. OpenApps architecture allows your MPM Printer to talk to your manufacturing execution system (MES) for increased functionality without custom development. ITW EAE (formerly Speedline) is the first SMT company to offer open software architecture. The Momentum Elite incorporates expanded 2D inspection capabilities, featuring both the MPM patented contrast and texture-based technologies: BridgeVision™ and StencilVision™. 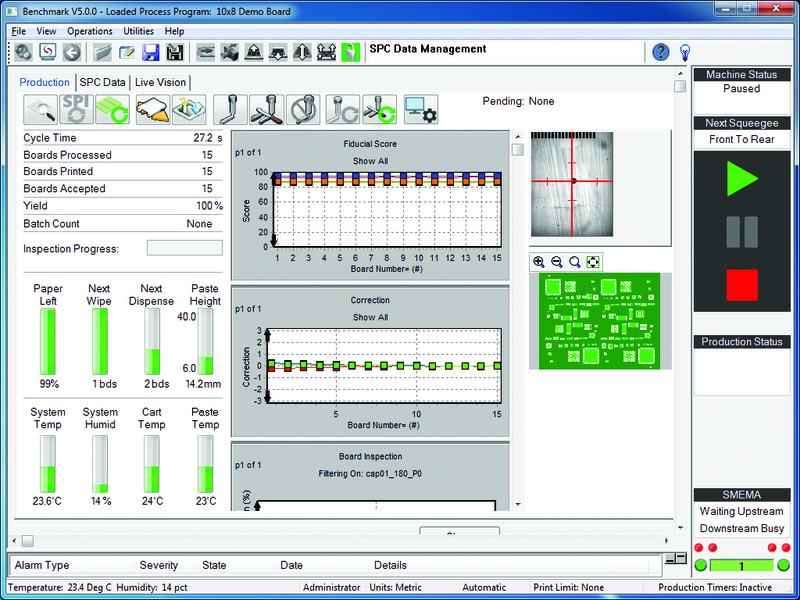 Powerful statistical process control (SPC) tools combine with these advanced vision and data acquisition technologies to facilitate maximum process analysis and optimization. Single axis, closed-loop pressure control for dual squeegee eliminates front-to-back variation. A single high precision load cell provides squeegee force, and a unique algorithm calibrates out non-linearity, maintaining the set pressure across the entire board surface. Automatic Pin Placement is a patented MPM tooling solution that uses the vision gantry to precisely place and remove pins. Pin patterns are software programmable ensures quick, easy and repeatable product changeover. Whether adding solder paste for components or epoxy for connectors, the Camalot Inside system ensures optimum dispense speeds while improving production line flexibility and productivity. The EdgeLoc system uses software-controlled pressure for optimal board holding force. The EdgeLoc system automatically adapts to the programmed board thickness and firmly holds the board without the use of top clamps. The EnclosedFlow print head offers significant process and cost advantages over printing with metal squeegee blades, particularly for fine-feature printing. Solder paste is held within an enclosed chamber, and is directly pressurized during the print stroke to provide uniform and complete aperture filling for the full range of aperture sizes and fill types. The EnclosedFlow print head delivers superior volume/yield on fine pitch pads. Print fine pitch features such as 01005s and 0.3 mm pitch CSPs with up to 50% greater volume and 25% lower deviation that squeegee blades. The EnclosedFlow print head ensures optimal aperture filling for fine pitch devices and crisp uniform printing with less waste. MPM OpenApps features an open architecture source code which equips customers and third parties with the opportunity for developing custom interfaces in support of Industry 4.0 initiatives and Manufacturing Execution Systems (MES). The paste height monitor is a robust solution that allows the user to monitor the paste roll size on the front squeegee blade during a print stroke. All pertinent information that can be used to track products or troubleshoot the process if needed. A flexible web reporting interface can be user-configured to produce traceability reports. The RapidClean stencil cleaner is a high-speed stencil cleaning solution that improves cleaning performance and cuts cycle time. The RapidClean stencil cleaner provides precise wet/dry wipe transition and exceptional cleaning results with its paper over plenum design, venture vacuum, and patented roller solvent bar delivery system. Built on our patented optics technology, RapidView system delivers high-speed 2D inspection with device-level SPC reporting. RapidView inspection is up to three and half times faster than our standard system, can increase Field of View (FOE) 4x, and can work in conjunction with our GerberEZ Teach system. The SPI print optimizer communicates with the external Solder Paste Inspection (SPI) system to continuously monitor and auto-correct X, Y, and Theta registration on the fly to stay on target and prevent print defects.